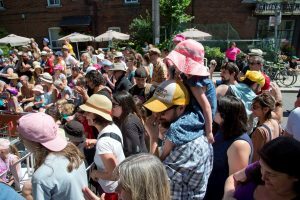 The Roncy Rocks event team is ramping up to celebrate the neighbourhood along Roncesvalles Avenue on June 17th. Roncesvalles Village abounds with creative talent. Artists, entrepreneurs and other inspired community leaders and volunteers make marvellous things happen. They exemplify the spirit we cherish. Roncy Rocks celebrates this spirit by showcasing accomplished and rising local talent along Roncesvalles Avenue. Music on the Main Stage at Wright Ave. Kids activities at Fern Ave.
Roncesvalles Avenue will NOT be closed. The 504 streetcar will continue to run up and down the street. A small portion of four side streets adjoining Roncesvalles will be closed. The remaining part of these side streets will be two-way for the day. Local artists are invited to apply for space at this year’s Art Zone at Westminster Avenue. The application deadline for this juried show is May 28th. Artist’s Application Form. The music lineup will be announced on our Roncy Rocks website and Facebook pages. Meanwhile, you can still take a look back at 2016. If you and a friend can help us make Roncy ROCK on June 17th, please check what’s available on our Volunteer page and signup using our Volunteer Registration Form. Mark the date and invite your friends. This entry was posted in CURRENT, Events and tagged artists, demos, fashion, film, food, music, roncy, roncyrocks, samples, shops on April 29, 2017 by Veronica Feihl, Executive Director, RVBIA.